The Systolic Blood Pressure Intervention Trial (SPRINT) recently reported that lowering BP to a systolic BP target <120 mmHg reduced the risk of a composite cardiovascular disease outcome and total mortality in a diverse study population enriched with patients with CKD.15 There was no evidence that the benefits observed in the SPRINT differed by CKD status during a median follow-up duration of 3.3 years. However, intensive BP lowering in the SPRINT was also associated with a higher risk of orthostatic hypotension, AKI, and electrolyte abnormalities; the long-term consequences of these adverse events are unclear.15 In a recent post hoc analysis of the Secondary Prevention of Small Subcortical Strokes Trial, which randomized persons with a history of stroke to a lower systolic BP target of <130 mmHg during a mean follow-up of 3.7 years, intensive BP lowering was found to associate with more rapid renal function decline.16 Understanding the long-term sequelae of intensive BP lowering beyond the typical duration of BP trials is important as clinical practice shifts toward more aggressive BP treatment following the results of the SPRINT. To further inform the discussion about the long-term benefit of strict BP control in CKD, including assessing whether treatment to <140/90 mmHg is associated with long–term ESRD and mortality risk, we performed extended follow-up of the AASK enrollees who were previously randomized to strict versus usual BP control using a combination of direct follow-up and administrative data. In exploratory analyses, we also performed a meta-analysis of the long-term risk of ESRD and death using individual-level data from MDRD and AASK, two of the largest CKD trials that now provide two decades of follow-up for outcomes of interest. The baseline characteristics of the AASK participants included in this study (n=1067) are shown in Table 1. Those randomized to strict versus usual BP control were balanced in terms of demographic characteristics and comorbidities, with the exception of smoking status at baseline (Table 1). Median follow-up starting from the time of randomization until death was 14.4 (interquartile range, 9.6–15.8) years. This long–term follow-up for the 1067 (of 1094 original AASK participants) with available health identifiers is complete through June of 2012 given that our follow-up is achieved by linkage to administrative databases. There were 397 AASK participants who developed ESRD (Figure 1), including 207 in the usual BP control arm (incidence =3.71 per 100 person-years; 95% CI, 3.23 to 4.25) and 190 in the strict BP control arm (incidence =3.44 per 100 person-years; 95% CI, 2.98 to 3.96). The risk of ESRD in unadjusted Cox model was 0.92 (95% CI, 0.75 to 1.12) and 0.95 (95% CI, 0.78 to 1.16; P=0.64) in adjusted Cox models, comparing strict versus usual BP arms (Figure 2A). There were 249 deaths among those randomized to the usual BP control arm (incidence =3.70 per 100 person-years; 95% CI, 3.27 to 4.19) and 226 in the strict BP control arm (incidence =3.42 per 100 person-years; 95% CI, 3.00 to 3.90). There was no statistically significant difference in the risk of death between strict versus usual BP arms in unadjusted Cox model (HR, 0.92; 95% CI, 0.77 to 1.10; P=0.36) (Figure 2B). In adjusted Cox models, the risk of death was 0.81 (95% CI, 0.68 to 0.98; P=0.03). There were no significant interactions noted between BP goal assignment and proteinuria, baseline GFR, or antihypertensive drug assignment (all P>0.05) for the outcome of mortality. There was also no statistically significant interaction between BP goal assignment and baseline GFR or antihypertensive drug assignment (all P>0.05) for the outcome of ESRD. However, there was a statistically significant interaction between BP assignment and proteinuria for the risk of ESRD (P=0.02). For participants who had <1 g/d proteinuria at baseline (n=892), risk of ESRD was 1.05 (95% CI, 0.83 to 1.32) comparing strict versus usual BP arms. In participants who had ≥1 g/d proteinuria at baseline (n=175), risk of ESRD was 0.59 (95% CI, 0.41 to 0.85) comparing strict versus usual BP arms in unadjusted analysis. Characteristics of the study population in meta-analysis of individual-level data from AASK and MDRD are shown in Supplemental Table 1. During median follow-up duration of 14.9 years (interquartile range, 10.2–17.2 years) from time of randomization until death, a total of 1024 participants developed ESRD (Supplemental Figure 1). Risk of ESRD in unadjusted pooled analysis was 0.88 times lower in the strict versus usual BP arms (95% CI, 0.78 to 1.00; P=0.04) (Supplemental Figure 2A). 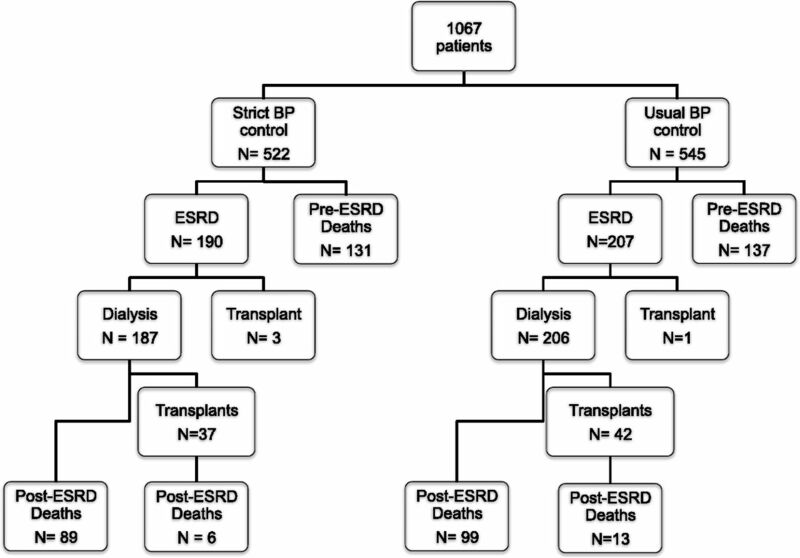 Of the 1024 patients with ESRD, 39% occurred in AASK, and 61% occurred in MDRD. Of the 920 deaths that occurred, 52% of deaths occurred in AASK, and 48% occurred in MDRD. Participants previously randomized to strict BP control had a lower risk of death, regardless of ESRD status (unadjusted HR, 0.87; 95% CI, 0.76 to 0.99) (Supplemental Figure 2B). There are several reasons why the association between BP treatment strategy and mortality risk may have been less robust in AASK compared with our prior findings in MDRD. First, there may be racial differences in the response to pharmacologic BP treatment and its benefit on long–term (post–ESRD) mortality risk.26,27 MDRD was a predominantly white cohort, whereas AASK only enrolled blacks. The benefit of intensive BP control during CKD may not extend to mortality benefits in similar fashion in both blacks and whites. It is also important to note that the overall rate of cardiovascular events was low during the AASK trial and cohort studies,28 and patients at elevated cardiovascular risk were excluded. This may account for some of the differences in our findings behind MDRD and AASK. Second, the distribution of deaths was different in MDRD and AASK. Although a higher number of deaths occurred in AASK (n=475) compared with MDRD (n=445), the majority of deaths in AASK occurred before ESRD onset, whereas the majority of deaths in MDRD occurred after ESRD, possibly because of the lower baseline GFR in MDRD.11 The benefit of strict BP control was noted to be especially prominent after ESRD onset in our prior MDRD analysis. Because AASK had a smaller number of deaths occur after ESRD, this may have contributed to the differences in our results. Third, unlike in MDRD, where no specific BP treatment strategy was specified after the end of the trial, 63% of AASK trial participants were enrolled in AASK cohort study after trial closure if they had not developed ESRD or died. During the AASK cohort, BP was managed per protocol to a target of <130/80 mmHg.9 Thus, the crossover of the patients in AASK previously randomized to the usual BP control arm to a more strict BP control strategy may have attenuated the differences in the two arms. Fourth, the AASK participants all had hypertensive nephrosclerosis as the cause of their CKD, whereas the MDRD participants were a more heterogeneous population (including approximately 20% of participants with polycystic kidney disease). Cause of CKD could potentially be important in the effect of strict BP control on mortality risk after ESRD. Our long–term observational follow-up of the effect of the delivered BP intervention during AASK should be interpreted in the context of the results of SPRINT, which was terminated after showing that, among patients without diabetes at high risk for cardiovascular events, targeting a systolic BP of <120 mmHg compared with <140 mmHg resulted in lower rates of fatal and nonfatal major cardiovascular events and death from any cause.15 This cardiovascular and mortality benefit was not different in patients with and without CKD, with risk of death being 0.82 times lower (95% CI, 0.63 to 1.07) in the intensive versus standard treatment arm in the CKD subgroup and similar to our effect sizes in both MDRD and AASK. However, it should again be highlighted that our study differs from SPRINT in that we included deaths before and after ESRD in our analysis. Of note, we could not provide consistent evidence that strict BP control lowers the long-term risk of ESRD in either the AASK or the MDRD Trials when analyzed separately, although in subgroup analysis, the AASK participants with higher levels of proteinuria (≥1 g/d) did seem to have a benefit from strict BP control.9 In our primary mortality analysis of the MDRD data, sensitivity analysis of the AASK data using adjusted models, and meta-analysis of the two data sources, there was a consistent and statistically significant reduction in the risk of mortality during long–term follow-up.11 Although the historical focus in prior trials conducted in patients with CKD has been on the role of intensive BP control in delaying risk of ESRD, the long-term benefit of nonrenal outcomes may be more sensitive to this intervention. Thus, our study does provide some reassurance that—not withstanding any acute rises in serum creatinine associated with more intensive BP lowering (such as that observed in the SPRINT)15,29—there was no evidence of an increased risk of ESRD during long–term follow-up. The strengths of our study include the preservation of the intention to treat analysis on the basis of the original randomized control trial design and the ascertainment of long–term hard outcomes on 98% of the original AASK enrollees. In addition, we include deaths both before and after ESRD in our study, which is unique. Limitations to this study include the lack of follow-up data on BP levels after the end of AASK. We also acknowledge that the racial background and cause of CKD differ significantly between MDRD and AASK, which may complicate the interpretation of the combined study results. In addition, trial participants represent a select group of patients, and therefore, results from trials may not always generalize to the general CKD population. Nevertheless, randomized trials provide the best internal validity regarding the effect of interventions and are the best guide to both potential benefits and harms of treatment. In conclusion, strict BP control in black clinical trial participants was not associated with increased risk of all-cause mortality, a concern raised by a number of observational studies.8,12,14 There was also no evidence of a difference in the risk of ESRD in association with an intensive BP control strategy during long–term follow-up of AASK participants overall, although those with significant proteinuria may benefit from this strategy. Overall, our data suggest that strict BP control strategy may lead to a mortality benefit and are consistent with those of SPRINT. We believe that our data offer useful evidence of the long-term association between intensive BP control and renal and nonrenal outcomes. Patients without identifiers available for linkage to external databases (n=27) were excluded from analyses. Institutional review board approval was obtained for data linkage at all 21 original AASK clinic centers, Cleveland Clinic Data Coordinating Center, and University of California, San Francisco. We tested for differences between characteristics at the time of randomization and ESRD onset using t test, chi-squared test, or Kruskal–Wallis test as appropriate. To preserve the original randomization scheme, all primary analyses were conducted in an intention to treat fashion. The primary outcomes, ESRD and all-cause mortality, were assessed by BP goal assignment in an unadjusted Cox model starting at the time of randomization. After completion of our preplanned analysis, we performed a supplementary meta-analysis of individual-level data from MDRD and AASK and repeated our unadjusted Cox models examining the risk of ESRD and all-cause mortality (including deaths before and after ESRD) with stratification by data source. Stata 13 (StataCorp., College Station, TX) and SAS (SAS Institute Inc., Cary, NC) were used for the performance of all statistical analyses. P values <0.05 were considered statistically significant for all analyses, including interaction terms. We thank Karen Brittain (Cleveland Clinic); Tammy Lightfoot (University of Texas Southwestern Nephrology Clinical and Translational Research Center); Martha Cruz (University of Texas Southwestern Nephrology Clinical and Translational Research Center); Donna Dowie (Harlem Hospital Center); Virginia Sanford (Meharry Medical College); Winifred Smith (Morehouse School of Medicine); Holly Johnson (University of California, Los Angeles) Deborah Brooks (Medical University of South Carolina); and Drs. Joel Kopple, Gabriel Contreras, William Cleveland, Marquetta Faulkner, Kenneth Jamerson, and Otello Randall for their assistance. We also thank Feng Lin for her assistance with statistical analysis and verification. This work was supported by the American Kidney Fund and National Institutes of Health (NIH) grants F32DK098871 (to E.K. ), KL2TR00014 (to E.K. ), K23HL131023 (to E.K. ), and K24DK92291 (to C.-y.H.). J.H.I. was supported by American Heart Association Established Investigator award 14EIA18560026. M.S.L. was supported by NIH grants DK048689 and RR000071. K.N. was supported by NIH grants 000182, UL1TR000124, and P30AG021684. E.D.S. was supported by NIH grant K23DK088964. R.T. was supported by O’Brien Center NIH grant 3P30DK079328-09S1 and UT Southwestern Nephrology Clinical and Translational Research Center. The African American Study of Kidney Disease and Hypertension (AASK) trial and cohort study were conducted by the AASK investigators and supported by the National Institute of Diabetes and Digestive and Kidney Diseases (NIDDK). The data from the AASK trial and cohort reported here were supplied, in part, by the NIDDK Central Repositories. This manuscript does not necessarily reflect the opinions or views of the AASK trial and cohort study, the NIDDK Central Repositories, or NIDDK grants 000182, UL1TR000124, and P30AG021684. Its contents are solely the responsibility of the authors and do not necessarily represent the official views of the NIH. The interpretation and reporting of the data presented here are the responsibility of the authors and in no way should be seen as an official policy or interpretation of the US Government. This article contains supplemental material online at http://jasn.asnjournals.org/lookup/suppl/doi:10.1681/ASN.2016030326/-/DCSupplemental.